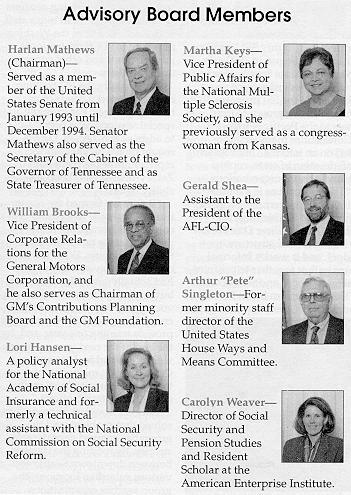 The 1994 legislation that made the Social Security Administration an independent agency also created a Social Security Advisory Board. The law provides for a bipartisan, seven- member Advisory Board, three members of which are to be appointed by the President, with two each being appointed by the Speaker of the House and the President pro tempore of the Senate. This board advises the Commissioner of Social Security on policies related to the old-age, survivors, and disability insurance programs, and to the Supplemental Security Income program. Although the law requires the board members to meet at least quarterly, they can convene as frequently as circumstances warrant. The board convened for the first time in February 1996.